These artisan tiles add a unique accent to foyers, walls and backsplashes. The clay from Saltillo tile comes from Saltillo, Mexico, which has some of the finest natural clay deposits in the world. These tiles are kiln-fired to create a hard, durable floor tile that's easy to maintain. These clay tiles come in a variety of colorful hues and patterns, but must be regularly sealed to protect its unique characteristics. Sealing Saltillo and terra cotta tile should always be done by a professional. Many store-bought sealers can cause yellowing. If done improperly, sealing can expose your tile to permanent staining, cracks and damage from foot traffic and debris. StoneCare uses and recommends Stonelok “MLT” Plus Sealer for a beautiful finish. Be sure to visit our case study gallery to view examples of our work. 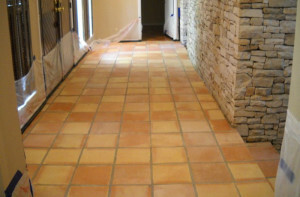 We can make your Mexican and quarry tile look beautiful again. Contact us online or call us: SAN ANTONIO (210) 656-8019 or AUSTIN (512) 250-2613.